This pass has been used for almost 3,000 years to cross the Alps. Julius Caesar crossed with an army in 57 BC. Today, along the route are signs with drawings commemorating Napolean's crossing with 46,000 soldiers in 1800. 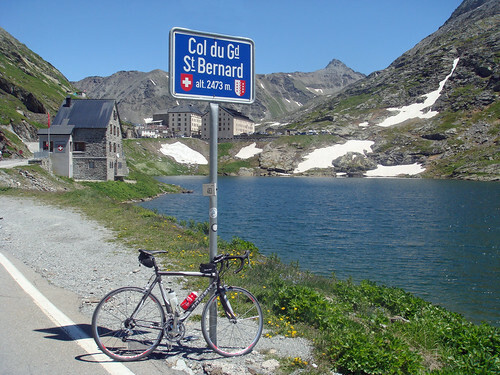 Col du Grand Saint Bernard is one of the highest Cycling Cols in the Alps at 2,469 metres (8,100 feet). And one of the longest at 45 kms from the Swiss side. In the 900’s Saint Bernard of Menthon opened a Hospice to provide a safe haven for travellers – the hospice is still operating today. 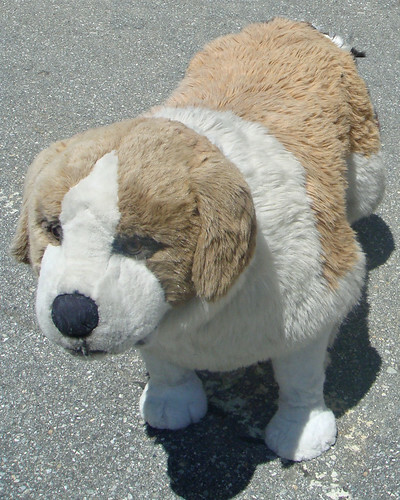 The Saint Bernard dog was first mentioned in 1709 and has become an icon of the alps. Stuffed versions were on sale everywhere at the top. I prefer beautiful routes to complete routes and I have avoided this great pass for a long time because quite honestly the lower part of the Swiss side is a lousy route. It’s on a main road with fast traffic and plenty of tunnels; and trucks heading for Italy. 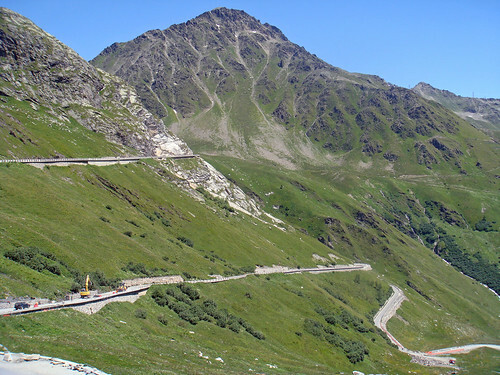 But as the route climbs, seven kms from the Col, the main road becomes a huge tunnel right through the Alps. And there is a little turn off to the old route (trucks are forbidden). From here on it’s a great ride. My cunning plan: Drive to this turn-off and cycle up. And then descend the other side into Italy until the old route meets up with the main road again. While purists will be appalled at not “doing the whole climb”, this worked perfectly for me and by combining two climbs it still resulted in almost 1500 metres (5000 feet) of climb. It wasn’t just the natilly dressed Italian customs officers that let me know I was in Italy. The road surface was awful on the south side. EDIT 2012: Since the Tour crossed the St Bernard a couple of years back, the Italian side has been resurfaced. Smooooooth. A wonderful ride on epic, very high, safe roads. Makes sense to me. Here’s a link to details of the Col du Petit Saint Bernard. 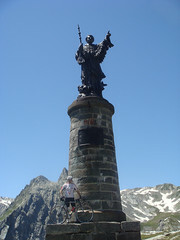 Nearby climb that links France and Italy. Previous ArticleLa Marmotte 2008 – Success! What are you using to track your rides or what software gives you all these great graphics? Italy! So, when are we going to ride from home and do a 3-country ride? Switzerland, France and Italy – in one day? Looks like this was a great col with lots of history. Italy’s roads are worse than in France? Yikes! Aren’t you starting the Tour de’Enfer soon? Anyway… Great history lessons you offer! Do you think it would help if you carried a little barrel of whiskey on your bike as did the Saint Bernard around his neck? OK… maybe that whiskey barrel is a legend but it’s still a good story. Cheers! Next Saturday is the kick-off BBQ at my house for the tour d’enfer. I will expect you late afternoon. Thanks for the info Will. 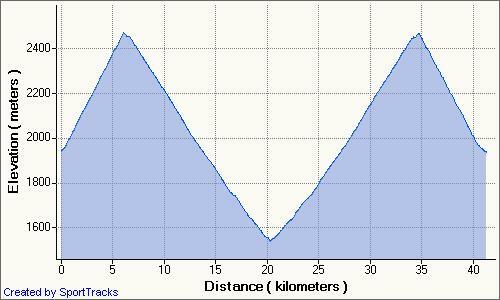 I was planning to do this climb from the Italian side as part of my current tour. But after looking at your elevation profile I might need to think again. Moi je prends ceux du site “Salite”, avec l’accord du concepteur. a un logiciel qui fait les profils (avec l’info en mes livres) et des coleurs ajouté. Totally agree with your description of the Swiss side from Martigny. It is very well signposted from the train station but the road is very busy and simply too narrow to allow bikes and other traffic. Just before the quiet last 4 miles there is a 6km 3-sided tunnel which is also terrifying as the noise from approaching traffic from behind roars like an airplane taking off. Heading back to Chamonix, bikes are only allowed on certain trains. Outside of peak season no-one seems to complain it you take in on any train. be careful of trains where you have to change to another train at the swiss border and ones that are direct but stop for a long time at the border as another very inviting train arrives on the other platform … arghh! It was the first time I had dozed off while on my bike. The Italian side looked beautiful with its wooded mountain sides new roads including wood clad safety barriers the traffic was quite at 14:00 all the Italians where asleep a massive contrast to the accent from Martigny. So even though the road maybe busy and narrow, is it legal to still ride on the road? or is it best not? Cracking good site mate- I have been using it for the last two years and it is always bang on. 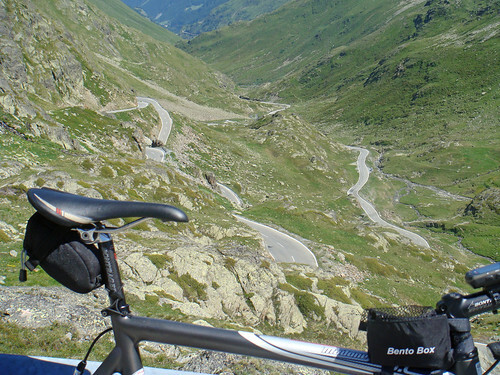 Rode the St Bernard this morning from above the tunnel on the Swiss side. Gorgeous morning with the sunrise greeting me at the top. The Italian side has clearly been resurfaced and looks like a life sized slot car track – perfect. Hi, Interesting article thanks. I plan to cycle from Italian side to swizz side, I have found the tunnel mentioned above on google maps, but where abouts is the ‘old road’ and is it easy to see on the map or satellite view?